I have been working with people in recovery from substance abuse for 8 years. 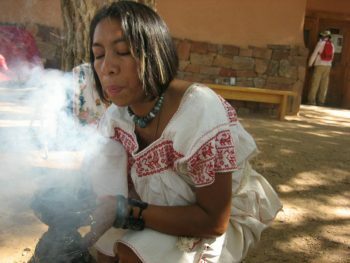 I want to continue using the traditional and ancestral medicinal art from Mexico, especially the temazcal (sweat lodge), mostly in the Valley of Española in northern New Mexico. I also want to continue working with women with the same ancestral knowledge with the intention to heal trauma derived from violence of gender. My intention is to continue helping women heal their bodies, souls and minds to feel empowered and strong enough to continue or discover their purpose in this earth. My idea is that when a woman heals herself, she will bring that healing to her family and to her community.